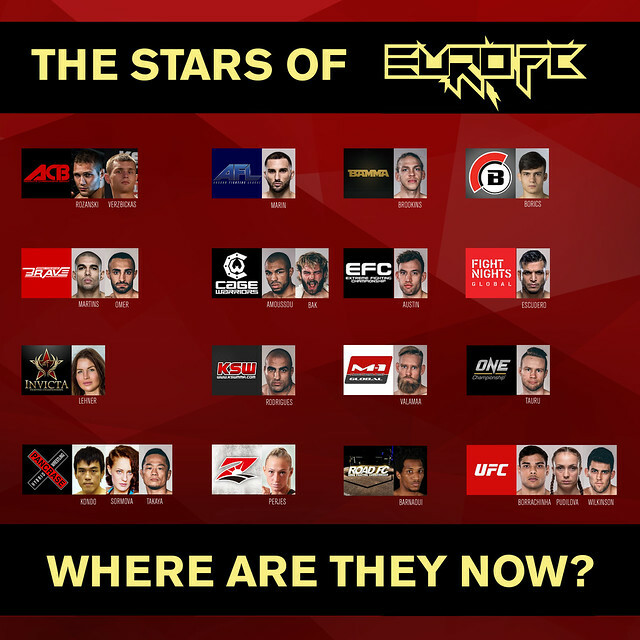 The Stars of EuroFC – Where are they now? Today marks the one-year anniversary of the first and at the same time last European Fighting Challenge event. Although the promotion was far too short-lived, the Espoo event was critically acclaimed and the roster I started to build during my 11-month stint with the organization, was arguably the finest group of free agents assembled in European MMA history. As EuroFC dissolved at the beginning of the year, I was of course at first disappointed to see my carefully curated group being scattered to the four winds, but looking at it now with a little distance, I’m very happy and proud to see what our athletes went on to achieve as almost all of those who did compete or were scheduled to compete for us managed to find a job with major organizations. Of the total of forty-one athletes that were under contract with EuroFC, a total of twenty-three went on to compete for some of the biggest organizations in the world, including the UFC, Bellator MMA, ONE Championship, RIZIN Fighting Federation, Invicta Fighting Championships and many others. I am particularly proud of Karl “Psycho” Amoussou and Fernando Santo Forte, who went on to win the championship at Cage Warriors and KSW respectively right after competing for us. Lucas Mineiro and Stuart Austin are scheduled to challenge for the Brave Combat Federation and EFC Worldwide titles later this year, while Mansour Barnaoui is among the final eight to win the ROAD FC $1 million tournament. I believe we had a great combination of seasoned veterans and exciting young prospects and the success these young ladies and gentlemen are enjoying right now proves me right. To all ambitious promoters out there: If you are looking for a matchmaker, sporting director or talent scout – my services will be available again very soon and I’m looking forward to build another strong roster and put on some more exciting fights for the fans.